The first treetop walkway in the Czech Republic offers the unique combination of experiences for its visitors. On the 675 m long Walkway, you will find not only unique view from the 40 m tower, but also many adventurous experiences. This all makes the Walkway an ideal destination for active visitors, families and seniors. Thanks to its barrier-free construction, the Walkway is suitable for all visitors. The ruin of the highest situated castle in the Czech Republic is located in the Svatý Tomáš Mountains along the old border 1053 m above sea level. The association of Vítkův Hrádek secured the statics of the ruin and built a viewing platform, which offers its visitors a beautiful view of the Lipno Lake. The bobsleigh track of Lipno nad Vltavou ranks among the best in the world thanks to both its length (1 km) and variety of features (21 bends, 2 tunnels and terrain breaks). There is a lift to take you to the start at the top of the hill overlooking Lake Lipno. You will get down through a stainless-steel corridor in a special car, where you control your speed using the brake lever. Children can ride with a parent or minder already when aged 3. Aged from 8 to 100 you can ride on your own or in twos. Open all year around, the longest go kart track in the area is located in Frymburk. There are 8 go karts Matter with Honda 200ccm engines with power of 5,5 HP, speed up to 60km/h and a race go kart for children MS Kart, engine Honda 50ccm. The aquapark and wellness in Frymburk means leisure and fun for guests of any age. The aqua park is equipped with an indoor swimming pool, 2 swimming lanes 25 m, wild river, water spring, whirlpool beds, hydro massage jets, water spouts, water slide 50 m long, children´s pool, equipped with water slide, sauna, salt cave and other wellness treatments. Lipno offers for lovers of hiking and nature an infrastructure of hiking trails in the Bohemian Forest in spring, summer and fall. Mushroom picking and nature sightseeing belongs to the most favorite activities. 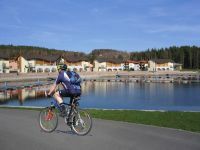 For cyclists, Lipno offers great conditions. Marked bike trails will lead you to the best sights and monuments in the area. The new lakeside bike trail leads right around the lake. From Frymburk you can spend a nice day around te lake and get back with the ferry. The largest technical monument in the Bohemian Forest. It begins near the Rosenauer memorial as a reservoir with an already damaged dam. It flows into the River Große Mühl in Austria and connects the Vltava River with the Danube River. Originally, the canal was designed for floating wood logs from inaccessible parts of the Šumava to Vienna. It was later modified and allowed to navigate up to 24 m long logs. The length of the canal is 44 km. It was fed by water from 27 streams, 3 reservoirs and the lake Plešné. Lake Plešné is located on a hillside of the Plechý mountain (1,378 meters) in an altitude of 1,089 m about 17 km south of Volary. It is of glacial origin. On the cliff above the lake stands the memorial of the writer Adalbert Stifter on the yellow tourist route. At the northern edge of the lake is a sea of stone boulders of coarse-grained granite. The observation Moldaublick on the southeastern hillside of the Austrian mountain Sulzberg (1041 m) is located 1 km from the Czech-Austrian border near Zadní Zvonková. It offers a beautiful view of the Czech side – water reservoir Lipno and its surroundings. The metal tower was built in 1967, it is 24 m high and has 137 steps. It is open from April to November. You can use tourist or skiing routes to get there. On the southern hillside of the mountain Sulzberg 1000 m above sea level you can visit the majestic 33 m high viewing tower. It was built by the brothers Resch only out of local fir wood. It represents the modern wooden architecture. The observation point is located only 4 km away from the border crossing in Zadní Zvonková – Schöneben and from 27 m above the ground you can enjoy a beautiful view of the area in all directions. Discover the natural beauty of Šumava and Lipno Lake from the deck of a ship. Cruise ships start from the docks in Lipno nad Vltavou and Frymburk. During the small or large cruise you will hear many interesting things about the lake and its specialties. On the new cruise ship Adalbert Stifter are organized evening sunset cruises with music, dinner and a toast. You can also try out the cuisine of the restaurant onboard. A beautiful river meandering the Bohemian Forest. Throughout the river are scattered camps and dozens of restaurants and snack bars. A unique experience is to see Český Krumlov from the riverside. You can either start your trip at Soumarský most or just below the dam in Vyšší Brod. 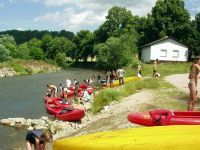 Canoes, rafts and all equipment are to rent at many of Lipno rental. Town of Vyšší Brod is certainly worth a visit. You should not miss the monastery Vyšší Brod, the monastery library, which contains over 70,000 books, postal museum as well as the natural monument Devil’s Wall and Luč. Rožmberk lies in a picturesque river valley, 10 km from the Austrian border and 25 km from Česky Krumlov. The Rožmberk castle built in the mid-13th century is one of the oldest castles of Vítkovci predecessors, one of the most prominent Czech noble families – Rožmberkové. Untouched nature, wonderful passage of the river Vltava and the historical background of the municipality are big attractions for tourists from around the world. Except the castle and chateau, it offers other cultural treasures such as a revolving auditorium, wax museum and the gallery of Egon Schiele. The town Český Krumlov is on the UNESCO list. Český Krumlov is located 30 km from our hotel. The Adalbert Stifter memorial is located in the birthplace of the writer. The house is included in the list of state-protected monuments. The ground floor is used for a permanent memorial exhibition “Adalbert Stifter and his native land,” and other areas of the building are used for other permanent exhibitions. The mission of the Frymburk museum is the collection of historical objects and artifacts from the former parish of Frymburk. 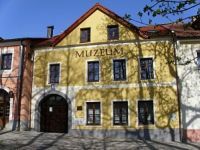 Along with the museum a voluntary organization was founded called the Frymburk museum and local history society. Both organizations take care of the preservations and presentations of anything interesting including things lost under water in the nearby Lipno Lake.